I'll admit I wasn't quite expecting to find what I did...I thought it would be quite some time before I found that!!! What am I talking about?? 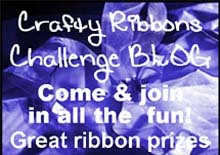 Well, a few weeks ago we once again took part in another Crafty Ribbons Challenge. The idea is that they send a notification out to crafters allowing them to apply to enter...we of course did that!! Then Ali from Crafty Ribbons sends you a bunch of her lovely ribbons and a theme to what she'd like you to create with them...This time the theme was "Vintage" seeing as the ribbons she'd sent us were from their new "Vintage Christmas" ribbon collection. Mum, Lady and I all made projects for the challenge and quickly sent them off to Ali so she could take them with her to the Christmas craft shows where they use all the projects as inspirational ideas to help sell their ribbons. So I printed and colourised a map and then stitched the route between Basingstoke (where we live) and Blandford Forum (where Crafty Ribbons are based)!!! I then added the little "from our house to yours" sentiment along with the ribbons, and there you have my completed card. We've got friends and family dotted all over the world in different places, so I have a funny feeling I'll be making a few more of these cards!! A Little Bit Of Purple!! The Return Of Felt Friday! !